Plateau, stall, being stuck, whatever you want to call it, being stuck in a period of limited progress is frustrating. I believe that 99% of people who do Keto will experience a plateau at some point. What is frustrating about plateaus is that they can come out of nowhere, last for a long time, and give no hint as to what is causing the hold up in progress. Whenever we hit a plateau our first reaction tends to be to cut calories. Of course, calorie restriction plays a key role in body composition, but it is not the only factor and if we continue cutting calories we will eventually get to a point where our metabolisms slow down, making progress even harder to see! There are other ways to bust through your plateau without cutting calories right away. With plateaus it is important to note that you may not be doing anything that wrong, you just may not be doing the most optimal things, which can interrupt or slow your weight loss progress. So, why do we plateau? Before we go too far, let’s discuss if you really are stuck at a plateau. 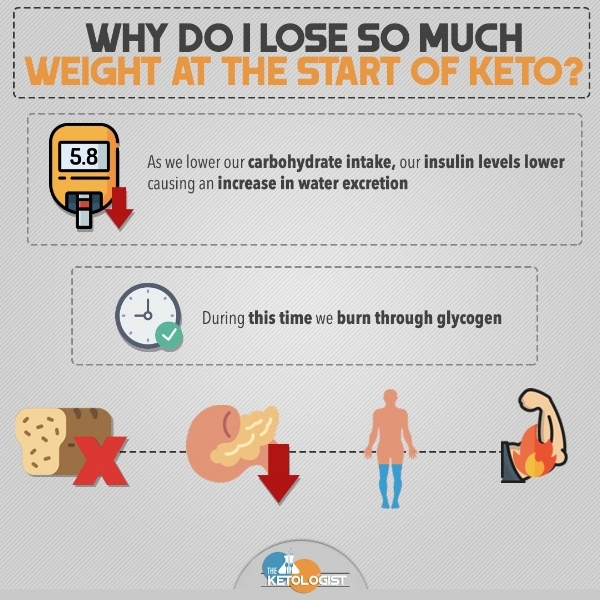 When we first start Keto, weight loss is very rapid. In some cases, it is not uncommon to see someone lose between 3-7 pounds in just one week! However, it is important to note where some of this weight loss is coming from. As we lower our carbohydrate intake, our insulin levels lower causing an increase in water excretion. Additionally, during this time we burn through our stored carbohydrates (glycogen) in rapid fashion. This contributes more to the weight being lost. All of this can happen in the first week and while fat burning is likely still occurring, the majority of weight being lost is water and glycogen. However, as we continue following a Ketogenic Diet, our water and glycogen levels tend to balance out. This can cause panic because you are not continuing that rapid weight loss you were experiencing at the beginning. This is not really a stall or plateau, rather a natural cycle that takes place during induction to a Ketogenic Diet. So, if you have been following Keto for a few weeks and you are concerned at being stuck at a plateau, I recommend sticking to it, you are still adapting! If you are not new to Keto and you haven’t seen any progress is 3-4 weeks, you are probably stuck at a plateau. If you have been just trying to increase your exercise to see more results and its not working, you are probably stuck at a plateau. If you are not going through Keto Adaptation but you have brain fog, you are probably stuck at a plateau. If you are doing Keto right, you should experience some strength endurance when you are at the gym. If you are not, you are probably stuck at a plateau. While there are other signs out there, these are typically the 5 most common I hear. Did any of these sound like you? There is not really a single reason why we plateau. There are many reasons why we plateau, but if we really simplify it, it all comes down to one thing. We adapt. Our bodies are programmed for efficiency. It’s a survival technique. The problem is that efficiency means the body gets to work less and that can equal a plateau. Whether you have been following Keto strictly or following lazy Keto, chances are your body is going to become efficient and the results will stop at some point. It is inevitable. Many times there are things we are doing in our diet that are less than optimal that could be causing a plateau. Maybe you are eating a certain food that is promoting inflammation. Maybe your metabolism has slowed down because you have been consuming low calorie for so long. Maybe switching up the exercises you are doing can help you bust through that plateau. There are so many factors that can be manipulated. The problem is that there is no single prescription for busting through a plateau. What you need to do is different from what someone else will need to do. This is a problem I have noticed for a while and that is why I recently build a plateau busting program to help! The program that I have built will help walk you through assessing yourself and making recommended changes to bust through your plateau. What I love about this program is that it helps you learn about your body, so you can know what to do to bust through future plateaus. If you feel like you may be stuck at a plateau, sign up for my email list to receive my 3 Phase DIY Keto Plateau Buster Program!